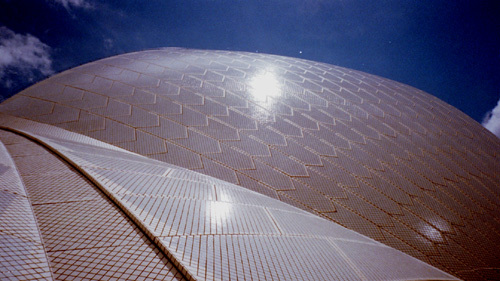 The story of the construction of Sydney Opera House is as remarkable as the building itself. 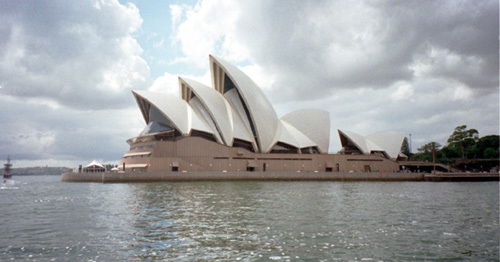 The revolutionary designs of Danish architect Jørn Utzon presented almost insurmountable problems to the structural engineers, while the proposed construction period of five years trebled and the budget spiralled from an estimated seven million Australian dollars to over 100 million (which, nevertheless, was all paid off within two years of the 1973 opening by the state lottery created to fund the project). Government interference caused Utzon to resign in 1966; he has never been back to Australia, has never seen the completed building and has never designed anything on such a magnificently reckless scale since. Most published photographs of the Opera House show it in its entirety. (The picture above, which I took from the ferry from Circular Quay to Darling Harbour, is typical.) But the real surprise and joy for me was in getting up close to the building and discovering the kind of detail such pictures don’t show you. 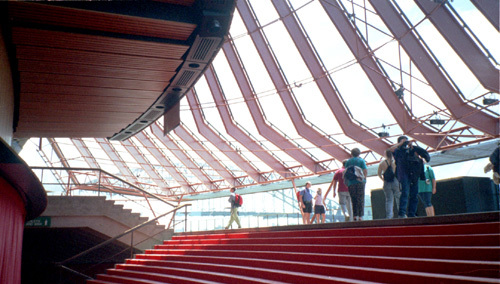 Walking up the breathtaking Monumental Steps and approaching the exterior of the Opera House, you begin to realise the complexity of the design. It is still simpler, however, than that which Jørn Utzon originally envisaged, and which ultimately proved impossible to build. 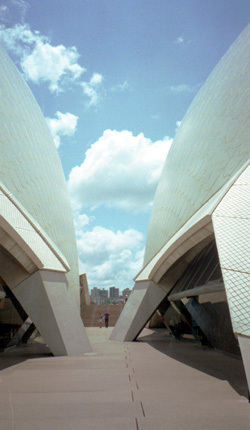 In Utzon’s altered design, the intersecting roof panels are all sections of a sphere of fixed radius, which allowed them to be pre-fabricated and then assembled on site. The roof is covered with over a million ceramic tiles. Instead of being white as I’d expected, these are in two subtly different creamy shades, interspersed in patterns resembling snakeskin. Pure white tiles would have made the building uncomfortable to look at in bright sunlight, whereas the softer colours reduce reflected glare. The coating on the tiles never needs cleaning; any accumulated grime is rinsed away naturally by rainwater. 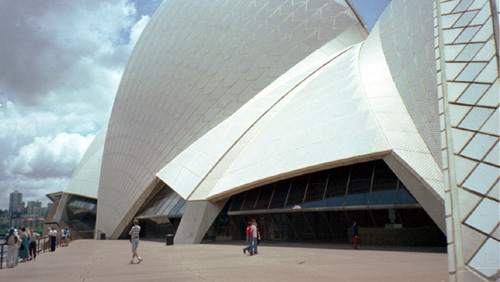 Perhaps the biggest surprise for many visitors is that the building known worldwide as the Opera House is not a single auditorium but five, and that opera represents only a small fraction of the events staged there. The two main performing spaces  the Concert Hall and the Opera Theatre  are even housed in separate external structures, linked by workshops and backstage areas below ground level. In this picture, the Concert Hall is on the left and the Opera Theatre on the right. There is also a Drama Theatre, a smaller Playhouse and a Studio. 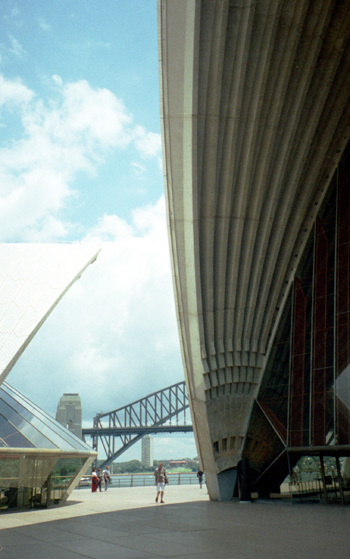 A third, smaller roof in the same style encloses the Bennelong Restaurant, seen here on the left. The massive arch to the right covers the entrance to the 2679-seater Concert Hall, the larger of the two main auditoria on the site. 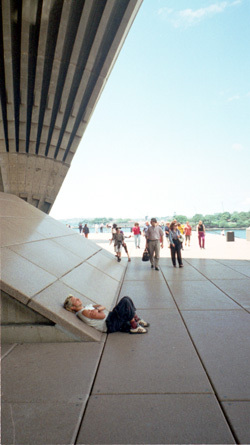 On a hot day in Sydney, the shade of this mighty roof provides a cool spot for a nap. The interior of the building is not as grandiose as Utzon’s magnificent shell  but it affords some of the best views of Sydney. This is the Opera Theatre’s circle foyer, looking out to the city’s other world-famous landmark  the Harbour Bridge. In prime position on Bennelong Point, overlooking Sydney’s glorious natural harbour, the multi-vaulted roof of the Opera House must be one of the most instantly recognisable manmade landmarks in the world  and one of the most extraordinary architectural visions ever to be realised. Billy Connolly said, "I always want to touch it and applaud it"; and it’s no wonder he likes the place  his 15 stand-up gigs in the Concert Hall in 1995 sold out in only 25 minutes, setting the record for the fastest sell-out in the venue’s history. But there’s more to his words than I’d realised; because getting close enough to touch "the nuns’ scrum" (one of the many colourful local nicknames for the building) is the only way truly to appreciate it. Next: climbing the Old Coathanger.